The company is promising “a loud and unprecedented, in-your-face campaign” to market the new plans. 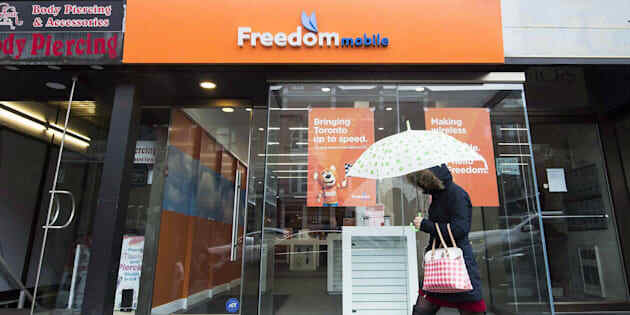 A woman walks past the rebranded signage of Freedom Mobile, in Toronto on Nov. 24, 2016. Freedom Mobile's new wireless plans include 10 GB of data for $50. Ever since Shaw Communications bought struggling Wind Mobile in 2016, and rebranded it as Freedom Mobile, some analysts have been predicting the rise of a fourth major wireless carrier in Canada. Freedom Mobile may have taken its first real move toward that status on Thursday, as it launched "Big Gig," a new set of wireless plans that it calls "unprecedented" in the Canadian market. The plans include 10 GB of data for $50 — and in a first for Canada, there are no overage fees. The cost is less than half the price of what that amount of data would run you at the big telcos, Bell, Rogers and Telus, or at their flanker brands, Fido, Koodo and Virgin. "Simply put, the Big Gig plans are a total game changer in the Canadian wireless industry," Freedom Mobile chief operating officer Paul McAleese said in a statement. "Offering our customers access to this much data on our new LTE network resets the marketplace and redefines what Canadians should be paying for data." Freedom is promising "a loud and unprecedented, in-your-face campaign" to market the new wireless plans. The arrival of a fourth national wireless carrier would almost certainly mean lower prices for consumers. As HuffPost Canada has previously reported, evidence shows that provinces with four major players, like Quebec and Saskatchewan, enjoy much lower wireless rates than other parts of the country. But that price impact may not come right away. Desjardins telecom analyst Maher Yaghi says that Freedom's lower-quality network means the big players will still be able to charge more for their services — for the time being. "We believe that there is significant operation risk related to Shaw's entry into wireless and that its inferior network should help to protect the pricing power of incumbents, at least until Shaw launches (potentially) a branded service on an improved network and with an improved device line-up later in 2018," Yaghi wrote, as quoted at the Financial Post. That "improved device line-up" is already in the works, with Freedom announcing this week it will be carrying the iPhone 8. The phone's absence from Freedom's line-up was yet another mark against it in the eyes of analysts. In its testing of wireless speeds, PCMag reported this fall that Shaw's investments in Freedom's network are helping the carrier to catch up to the Big Three wireless players when it comes to speed and reliability, but the company still has work to do. "Now that Freedom's LTE network is up and running in Toronto, we found that it's just as fast as Rogers is, while charging only half as much," PCMag reported. But Freedom's network was 10 per cent less reliable than Rogers' in Toronto, PCMag reported. It was 20 per cent less reliable in Calgary and 30 per cent less reliable in Hamilton, the magazine found.